Topic: What to pair to Cinnamon Blue Male? Re: What to pair to Cinnamon Blue Male? Thanks...Could you please tell me what color mutatiom on babies will I got If I pair Male Cinnamon Blue with Cobalt or Violet hen? Topic: What Babis will produce that pair? What Babis will produce that pair? what colors baby should be? What to pair to Cinnamon Blue Male? What you will be pair with Cinnamon Blue Male to get stunning colors babies ;)? Topic: What mutation is Papez? Re: What mutation is Papez? molossus wrote: well done. he looks really well raised. Topic: Is this considered normal green? Re: Is this considered normal green? He will be 8 months old on October 2. His name Zorro. He be with me since 5 weeks old and I was hand feed him. Love your all babies, they are very very cute. have a question: what are the parents colors of your "Buttercup" color baby? how you saw a violet there if the Mather is Lutino , Dad is green /split Lutino ? Re: WHAT is The Mutation of My Baby??? Johan S wrote: Well, I don't think it is a green pied either. I have some thoughts on what it could be, but would first like to see some more pictures, esp. ones including the flights and tail feathers. Are you sure it is green pied? Olive maybe? That is a very unique colour. So, What is the mutation??? my Rio,s ring has seen now ( he 1 year and 6 mons. old) , after just finished his heavy molt that long about month. McmillanBirds wrote: Here is a clearer picture of my golden cherry. The sun is shining through his tail feathers though so the centre feather looks lighter than what it is. In the shade it looks like your birds feathers. Topic: Any Alexandrine mutation collectors out there? Re: Any Alexandrine mutation collectors out there? RingNecker wrote: Its funny I saw your video on You Tube before I found your post anyways great job on the training. Thanks, some time he nippy and loud after he talks. I think he have bluffing period now. He love to bath, and after the bath he become a better. Topic: should i get an alexandrine? 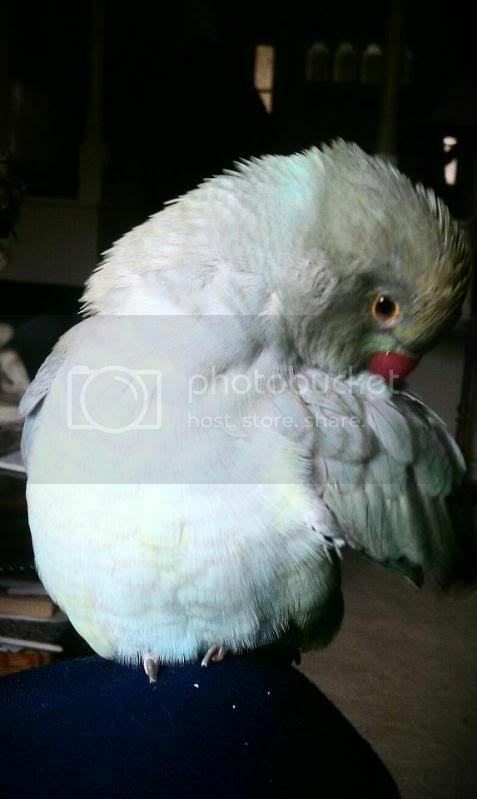 Re: should i get an alexandrine? Topic: Does anyone have a mature turquoise male?? Re: Does anyone have a mature turquoise male?? I like that color....beautiful bird! Thanks....he talk now up a storm, it so fanny when he start talking in the morning, when he wake up under cover of his cage. Do you breed them? What is your location? I was hope to find them too, but only green in USA. 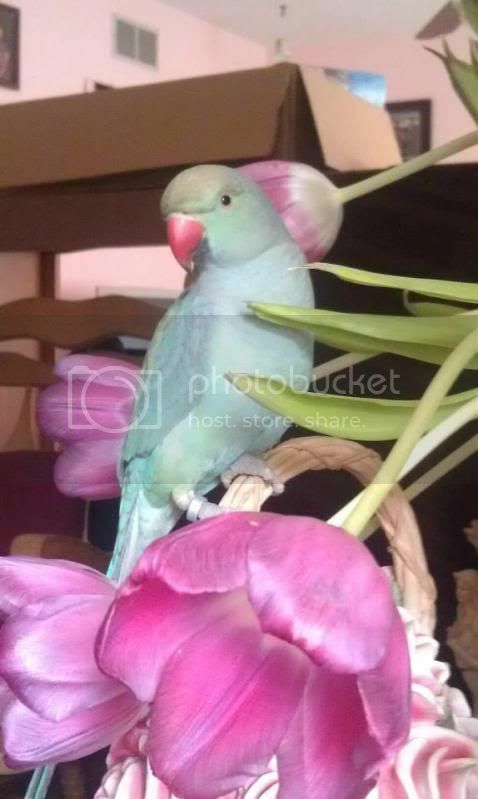 Here are web page were I got my Indian Ringneck parrot and soon in late spring will be buy new baby Alexandrine parrot from that breeder again, because I trust him 1000%. Topic: What mutation ringneck do you have?? Re: What mutation ringneck do you have?? ellieelectrons wrote: Beautiful photos of one very loved bird! Thanks for sharing. 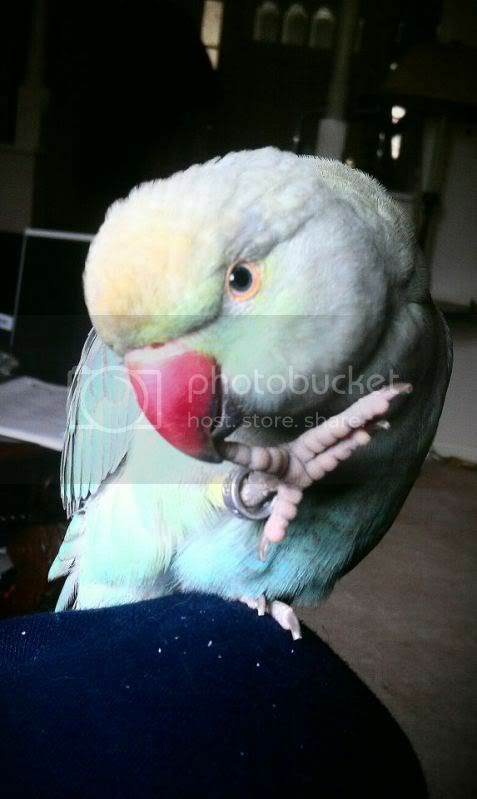 Very gorgeous parrot, thanks for share your pictures. My Rio was start to talk at 7.5 months old, NOW he 9.5 months and talks better. I will upload more video in a week or so. Louie wrote: If anyone has pics of their playgyms that they have bought or made I would love to see them as I am thinking about buying/making one and would like ome ideas . . .
Blueberrybird wrote: That is a really cool play gym! Did you make it? and set up a few ropes. He love to play there. Rio grow up and now he 7.5 months old. He Cinnamon Blue color. Here 23 New pictures upload. Enjoy. Wow...You have a such a beautiful pair of IRN. Best wish to have a cuties babies from them. and give there in a forum link to where you put photos. Topic: Violet Indian Ring neck. Is this a male or a female?Anybody? Re: Violet Indian Ring neck. Is this a male or a female? pinkdevil wrote: So cute and so clever. Melika, thanks for respond! Will try it...Think that he will be fine because 3 months ago he flight by DeltaCargo from my breeder at Alabama to NY. It was almost 8 hours of flight. I have other question do I need to cover him or he will be happy to see through the window of my car? Hi there, I have a question... Do you know it will be great idea to take my IRN with me for ride to my sister's house (about 2 hours drive) for all day and drive back then? May be better to live him home for that day ? He NOT go out from my home before, that why I asking... Thank You for re-spond :? pinkdevil wrote: Beautiful photos of a beautiful bird. thank you ...I love to have photo's from my bird. Topic: First IRN babies have hatched for 2011! Re: First IRN babies have hatched for 2011! I think it a boy. Topic: Charlie! My Blue IRN baby. Re: Charlie! My Blue IRN baby. I'm not expert, but try my guess - for me is hen on the right of your last picture. Very cute parrots. What is the color? Light blue or light grey? Topic: UpDate pic. Rio 3.5m. and NEW* friend Mikkie(girl) 2.5m. Re: UpDate pic. Rio 3.5m. and NEW* friend Mikkie(girl) 2.5m. I very love to picture them, they are so cutiest parrot in a world for me. my babies in separete cage only see each other, not play together. Woooow, how beautiful she is! Seems she very love you and love the scratches. but for me on last your picture 9 it seems for me at left girl and right boy, but if you still not DNA test them- how they look now? Topic: Picking Up My Baby In A Few Weeks, New To This ...! Re: Picking Up My Baby In A Few Weeks, New To This ...! but when you see new feathers growth up, he become more beautiful then. Ariahna wrote: Awww...what cuties. They are both gorgeous, and what a great setup you have for them. I loved the video, thanks for sharing it. We now a little bigger . Just came our birthday days- Mikkie girl - today 3 months (hatched April 22, 2011). Rio tomorrow 4 months (hatched March 23, 2011). It's not that they're not tame anymore of they have a friend or breed...they just have something else keeping them busy. If they live and play separately- do they still be NOT tame? mkurtak wrote: they can't have children under 3 years old. you are sure some time. and btw how you know they are boy and girl, you can't know that under 3 years old or pay DNA check. Thanks for respond and answers! UpDate pic. Rio 3.5m. and NEW* friend Mikkie(girl) 2.5m. Hi there, we'd like to show here our video. Thanks for watching. Enjoy. 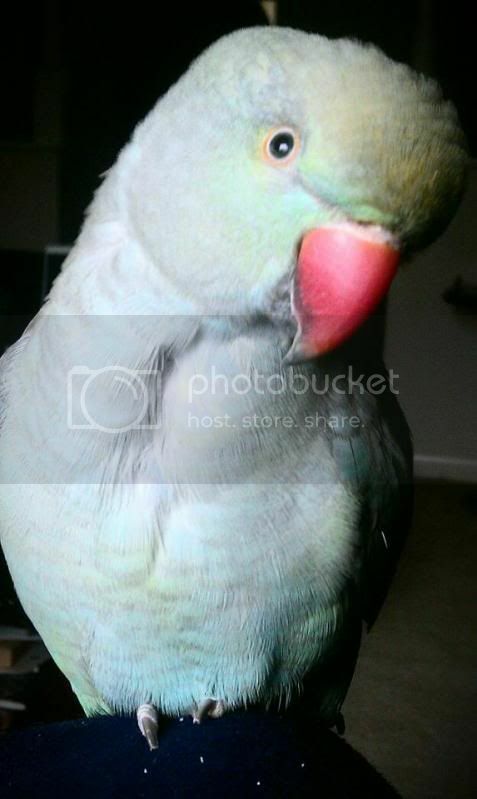 Ring Neck wrote: Rio is very cute, I can see that you love him. Nice pictures. Re: My Cinammon Blue Indian Ringneck-Rio= 2.5 months old! Dare2b wrote: He looks more lacewing or Pallandino to me than a cinnamon wing blue. Maybe a skyblue but I cant see clearly. Nice looking boy, will grow into a gorgeous bird!